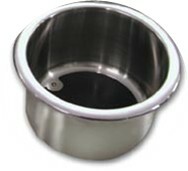 Straight sided (not stepped) drinkholder is made of 316 stainless steel for lasting durability & good looks. Highly polished rim and brushed interior with foam pad and weep holes at the bottom. 3M closed cell foam tape under the lip holds it securely in place with no additional sealant needed. Dimensions: 3-5/8" diameter cutout, 2-3/8" deep, rim 4-1/4" overall diameter.